September 12 is the 255th day of the year(256th in leap years) in the Gregorian calendar.There are 110 days remaining until the end of the year. 1609 – Henry Hudson begins his exploration of the Hudson River while aboard the Halve Maen . Year 490 BC was a year of the pre-Julian Roman calendar. At the time, it was known as the Year of the Consulship of Camerinus and Flavus. The denomination 490 BC for this year has been used since the early medieval period, when the Anno Domini calendar era became the prevalent method in Europe for naming years. Year 372 (CCCLXXII) was a leap year starting on Sunday of the Julian calendar. At the time, it was known as the Year of the Consulship of Modestus and Arintheus. The denomination 372 for this year has been used since the early medieval period, when the Anno Domini calendar era became the prevalent method in Europe for naming years. Year 1415 (MCDXV) was a common year starting on Tuesday of the Julian calendar. Nefingus, in French Néfingue, was the bishop of Angers from 966 until his death. His predecessor, Aimo, died on 19 October 966. Saint Guy of Anderlecht was a Catholic saint. He was known as the "Poor Man of Anderlecht." The Feast of the Most Holy Name of the Blessed Virgin Mary is an optional memorial celebrated in the liturgical calendar of the Catholic Church on 12 September. It has been a universal Roman Rite feast since 1684, when Pope Innocent XI included it in the General Roman Calendar to commemorate the victory at the Battle of Vienna in 1683. 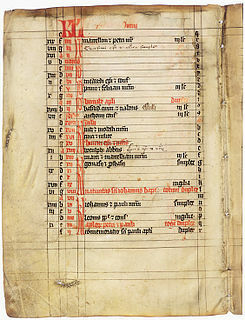 It was removed from the Church calendar in the liturgical reform following Vatican II but restored by Pope Saint John Paul II in 2002, along with the Feast of the Holy Name of Jesus. John Henry Hobart was the third Episcopal bishop of New York (1816–1830). He vigorously promoted the extension of the Episcopal Church in Central and Western New York. He founded the General Theological Seminary in New York City and Geneva College, later renamed Hobart Free College in 1852 after him, in Geneva, in the Finger Lakes area of upstate New York. Ebontius, also known as Ebon, Pontius, or Ponce, was Bishop of Barbastro, Spain, after its recapture from the Moors. Born in Comminges, Haute Garonne, France, he became a Benedictine and abbot before accepting the See of Babastro. ↑ "Demolition of Gaza homes completed". Ynetnews. 2005-01-09. Retrieved 2018-10-29. ↑ "Christopher Neame". British Film Institute. 2018. Retrieved 12 September 2018. ↑ Rose, Mike (September 12, 2018). "Today's top celebrity birthdays list for September 12, 2018". The Plain Dealer. Retrieved September 12, 2018. Wikimedia Commons has media related to September 12 .